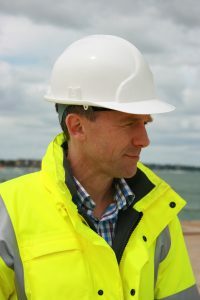 Hi, I’m Philip Wise, DIO’s Principal Project Manager for the major infrastructure investment currently taking place at HMNB Portsmouth to ready the base for the arrival of the Royal Navy’s Queen Elizabeth Carriers, which will be based in the city. The first ship, HMS Queen Elizabeth, will become the Navy’s flagship and is due to arrive at HMNB Portsmouth next year. 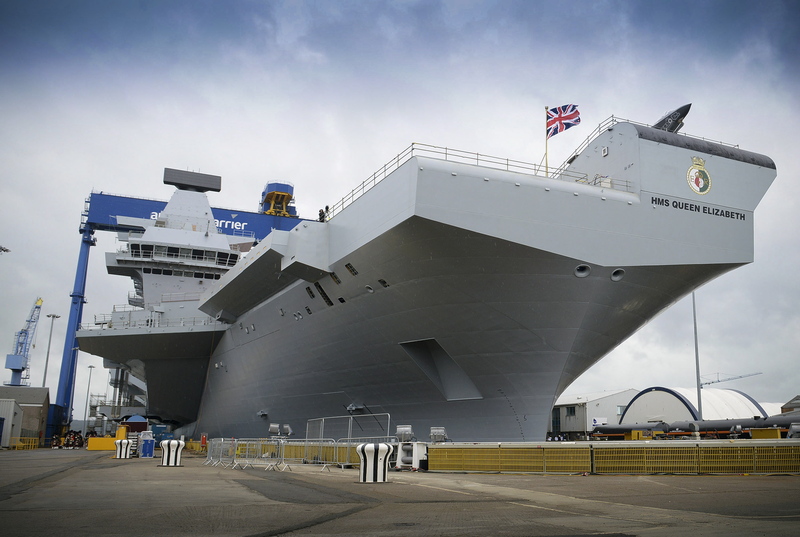 HMS Queen Elizabeth and her sister ship, HMS Prince of Wales, will be the biggest ships the Royal Navy has ever operated and will carry F-35(B) fighter jets. New facilities are needed in HMNB Portsmouth to support the ships and DIO is providing these. We’re dredging the approach channel and the harbour to make sure it is wide and deep enough for these large ships, providing navigation aids so they can find the correct approach, upgrading the jetty where the ships will be moored, and installing a high voltage power supply to provide the ship’s electricity needs. It’s a large and exciting project and one I’m really pleased to be working on. I’ve blogged about the project in the past, but we’ve just taken a major step forward on the power supply so I thought it was time for an update. 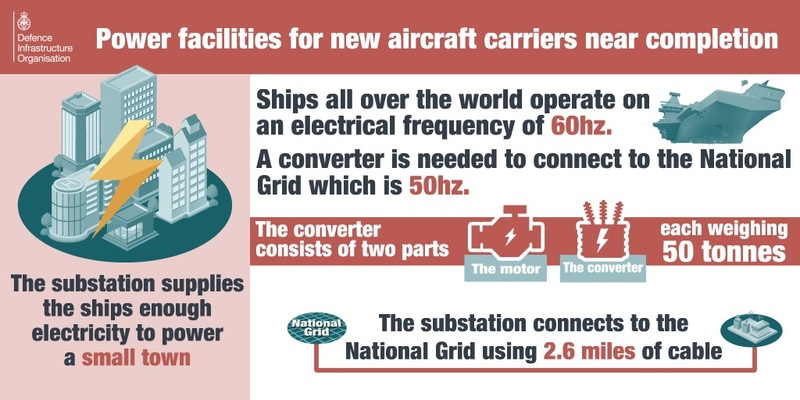 We’ve just taken delivery of a frequency converter, which is a vital part of the electrical equipment to power the aircraft carriers and has been purpose-built over the last 12 months. We’ve built a new substation to house the frequency converter and other elements of high voltage supply such as transformers and switchgear. The power comes from the National Grid, via 2.6 miles of cable we’ve installed between Old Portsmouth and the Jetty. All vessels, not just those of the Royal Navy, operate on a frequency of 60Hz. However, the UK National Grid runs at 50Hz, which means we need to increase the frequency before feeding the electricity to the ships. This is where the frequency converter comes in. It arrived in two parts, the converter itself and the motor; each of which weighs 50 tonnes! 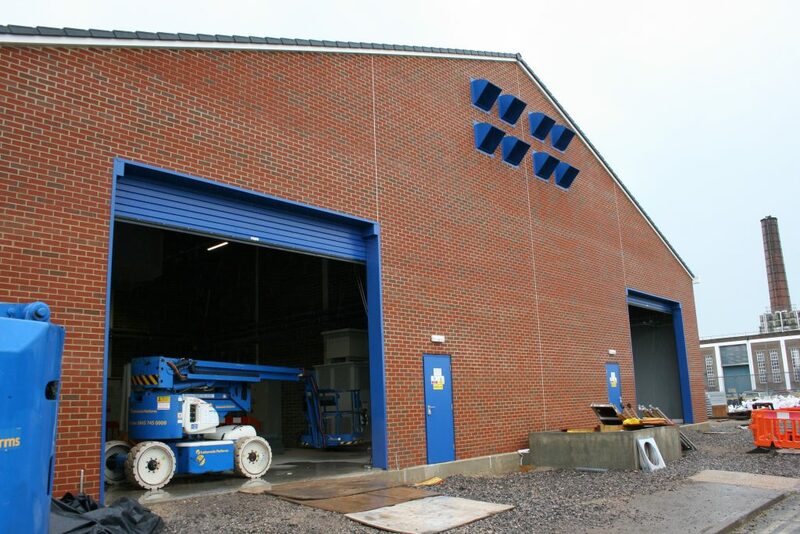 All in all, the substation supplies enough electricity to power a small town. The building has been finished for several months now and our contractors VolkerStevin are working hard to finish fitting it out internally. VolkerStevin are heavily involved in the works at Portsmouth as they are also upgrading the jetty and installing the navigation aids. Boskalis Westminster are dredging the channel. Once the electricity reaches the substation and has been converted to 60Hz, we still have to get it to the ships. For the final connection from jetty to vessel we need a hydraulic boom as such a large cable is unable to support its own weigh over the 20 metres between ship and shore. 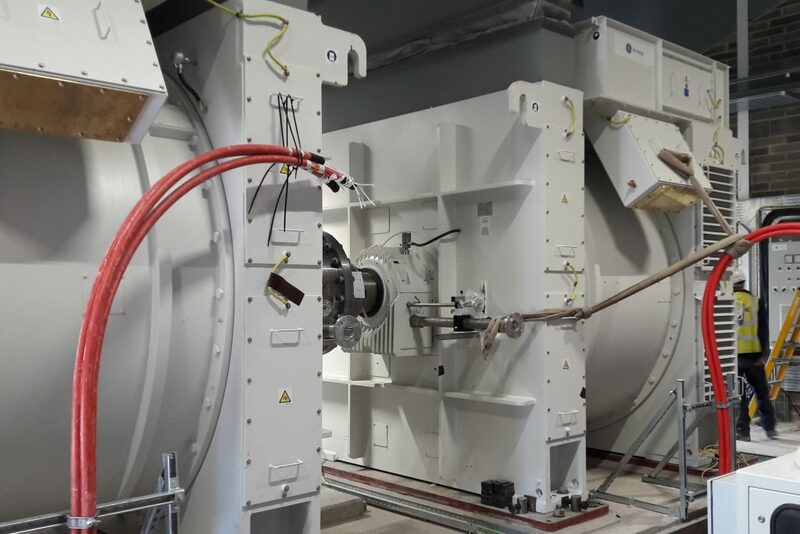 The boom is able to cope with ship and tide movements to ensure the power supply is protected and is telescopic so that it can be retracted when the carrier is at sea. Our boom is being constructed in Italy and will be delivered in early 2017, signalling completion of the works as a whole. The substation and power supply are vital for HMS Queen Elizabeth and HMS Prince of Wales so I’m pleased to be involved. Supporting the country’s new aircraft carriers is a good reason to come to work in the morning!